"My respect and love for the Griffin Farms Cattle family starts with the very first conversation i had with Amanda Griffin she understood what i was saying about my dogs. Knew what i was looking for in my new child. The quality of her breeding is perfect the attitude and loyalty is beyond belief. 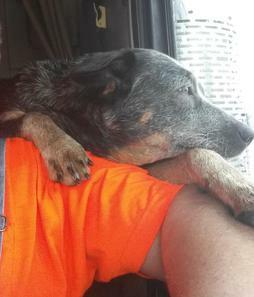 Her dogs are very sociable but yet retain the possessive traits of a heeler. My girl was very easy to how train, is very quick to learn. She is very protective and cautious over myself and my wife. Tho she is a little jealous of my wife still Lol. The Griffin family are old school real people. They truly care about all! At the time i got my girl, there was a lot of things going on in my life. My brother was dying and things were all array. When i asked Amanda if she could hold Yepa for a bit till things straighten up some, without hesitation the answer was absolutely yes. And then when i asked to impose on their Christmas Eve to come pick up Yepa, I was greeted with open arms at 10 pm. 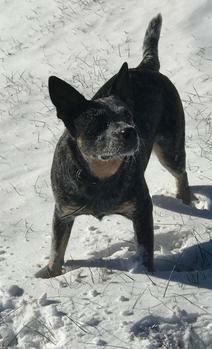 We visted and introduced Yepa to my other heelers. Got to meet Amanda's husband and son and was welcome in to their house and made at home like family. Then when my brother passed away we received the most wonderful arrangement from the Griffin family. Which i am very proud to say i still have it growing in my house to this day!! Amanda is always available for consult or advice help with dogs in any way. The quality of her heart is personified in her breeding program as it is in her husband and son. 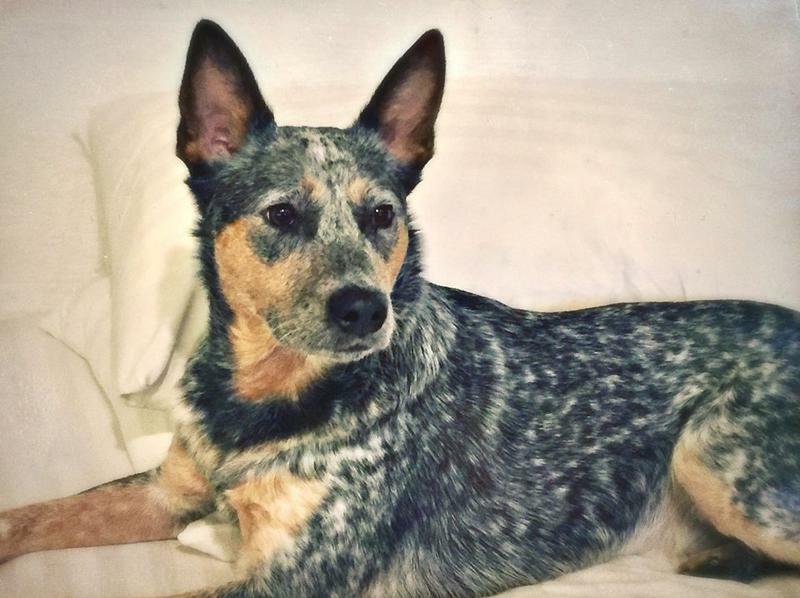 I am very proud to be part of the Griffin Cattle dog family. And equally as proud to own one of her dogs! My girl is named Yepa it is indian for winter princess, partially because of her white eyelash, but also because of the time of year and the things that was going on at the time. Amanda and her family along with Yepa was a blessing to me at the time and still to day!! 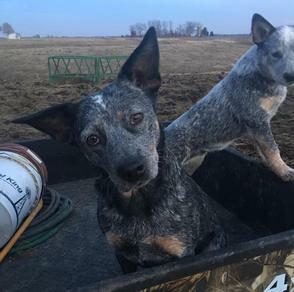 I brag about them to everyone and highly recommend if you know the breed and want a high quality heelers please check with GriffinFarms Cattle dogs. The quality and integrity is unmatched!!" 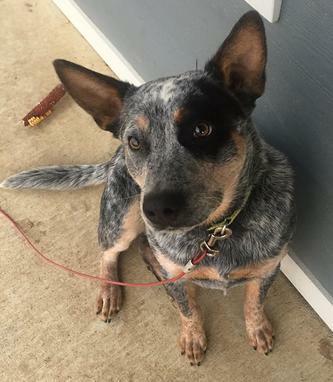 "In February of 2015, I lost my 3 year old ACD. 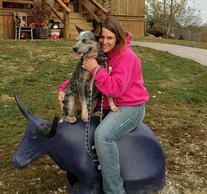 I knew almost instantly Griffin Farms Cattle Dogs was where I wanted to get my next pup. I wasn’t quite ready but I reached out to Amanda to get on their list. 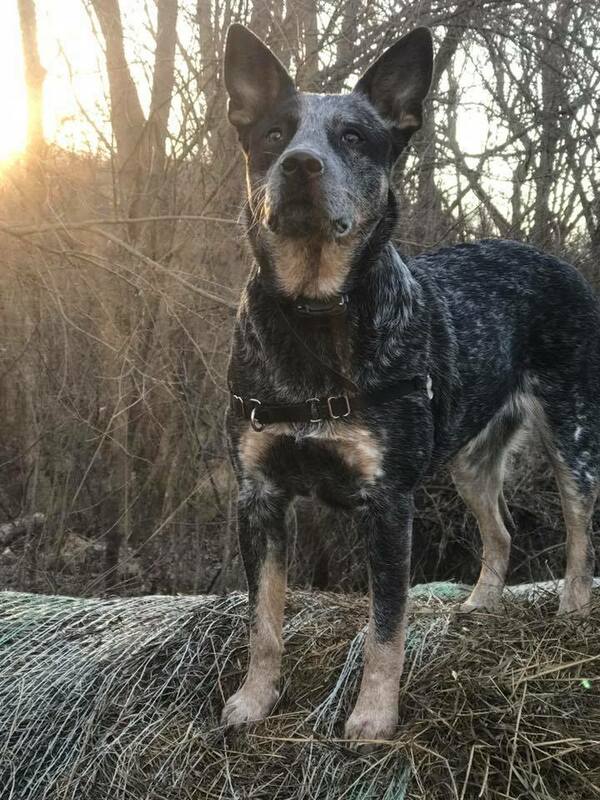 The next few months Amanda took the time to get to know me and learn what exactly I wanted and needed from my next Australian Cattle Dog. I wanted a big blocky head stocky male that was calm and loving enough to cuddle with me on the couch but also determined and assertive enough to work mean crazy bucking bulls with me. When the pups were born I got a video of their birth and new born pictures! I loved every single pup and had no clue how I would ever pick mine. Amanda held my hand and helped me the whole process. She knows her dogs so well that she was able to learn characteristics from the pups early. With Amanda’s help I was able to pick the pup that aligned with all my goals. Cotton is now 14 months and is exactly what I asked. He’s calm, level headed eager to please and is very bonded to me. In fact, when I went to pick up Cotton he in turn picked me! I had known him for only a couple hours when a group of us were in the driveway saying our “good byes.” Amanda noticed that Cotton was leaning on my feet as if to say “this one, I pick her!” We have been best friends ever since. I knew when I left the Griffin’s farm that I just acquired my best friend, but what I didn’t realize was I also gained a new family. The Griffin’s have become very close and we consider them family. They are always available and one of the best families I have ever met. 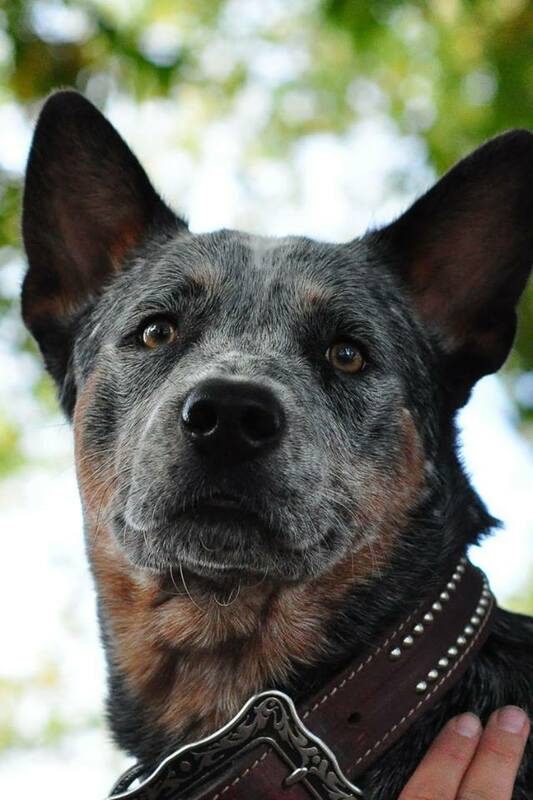 The pride the whole family puts in their Australian Cattle dogs, ranch and roping is exquisite." "My girl Abby got such a BIG personality. She's SMART, STUBBORN, SWEET, FUNNY, BEAUTIFUL, ATHLETIC, and well I could go on for ever. She's not just a dog she's family. She's not just my dog she's Curt's dog too. I have had dogs my entire life. They were good dogs and I LOVED them but Abby has always had a different personality and it's because of her beginning. She has always known love. Amanda truly LOVES ALL of her pups. She and her family play with them, nurture them, and socializes, them from birth. The first time I took Abby out to potty she ran and got me a stick and brought it to me. Puppy's don't just know that. It's a small example of how smart she is and how much love and care she got before we had her. She's got a STUBBORNNESS to her like no other dog but it's only because she's so darn smart. She THINKS on her own. She figures things out. If I can figure out a way to show Abby something she learns. Abby is sweet she does cuddle and she's good with my 19 year old cat. She's good with children, all people and other animals. I've had her around cats, chickens, rabbits, horses, etc. she dose EXCELLENT. I could go on for ever about my girl but to make this a little shorter we LOVE ❤ our girl and she LOVES us. She's the BEST CHRISTMAS PRESENT I've ever gotten and she's family. I also feel Amanda and her family are friends along with people who have her pups. Amanda had a reunion with her pups. She wore her heart on her sleeve when we went to it. She welcomed her pups back and was relieved that ALL were at loving homes." To anyone looking at pups at the Griffin Farms web page, congratulations! You are clearly an informed dog buyer, are doing your research, and understand the difference between buying a well-bred puppy and otherwise. As an owner of a Griffin Farms Australian Cattle Dog, here's what I think you're getting: a pup that is healthy and genetically sound. 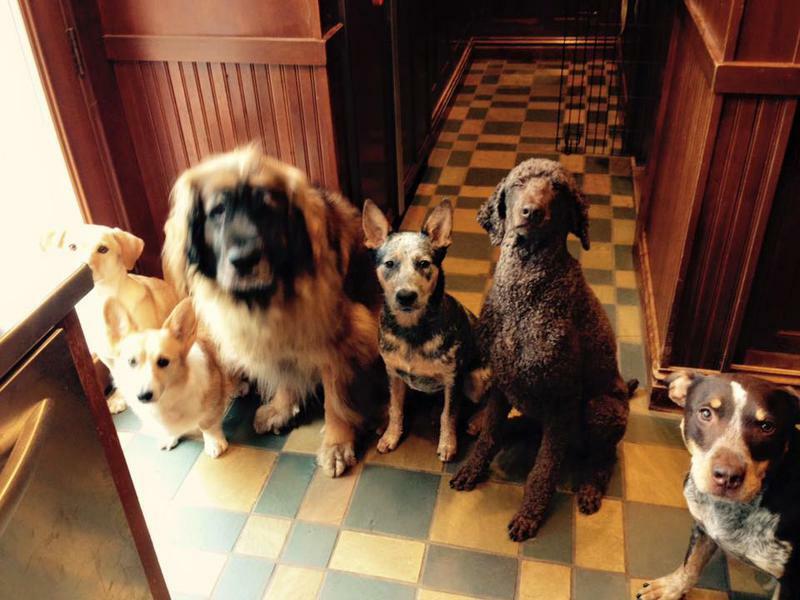 This small kennel specializes in one breed. They know the breed, have many years of experience, and breed only a few litters each year. Their cattle dog pups are exceptionally good-looking, handsome heads and ears, sturdy athletic builds and attractive colors and patterns. Even more important, they are breeding dogs that are temperamentally sound, people-focused, trainable, and intelligent. The pups at Griffin Farms are well socialized in the litter, handled frequently, exposed to new things, and given the kind of early stimulus that makes a dog confident and outgoing. Amanda and her family also invest a lot of time and emotion into each litter. She knows each pup and can tell you about each one's personality. All this effort shows in the results. 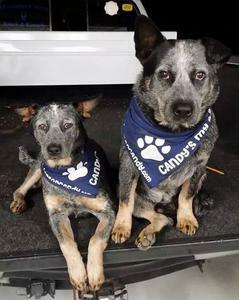 Her pups are adored family members of people that remain in contact with Griffin Farms, sharing photos, stories, and staying in contact with Amanda and each other. When you buy one of these pups, you are joining what feels like a very exclusive club, or a very welcoming family. My Griffin Farms dog is Deacon. He's bossy, fearless, silly, energetic, and keeps me on my toes every day. He loves training in agility, playing Frisbee, and snuggling.